Global warming is probably one of the most contentious issues currently. Al Gore’s film, “An Inconvenient Truth,” documents his belief that humans are the cause of this warming and of an impending catastrophe on the planet. Therefore, many experts call for reduction of greenhouse gas emissions, such as carbon dioxide. Dissenting experts claim that global warming is cyclical as evidenced by the several historical ice ages and periods of warming. They also point out that the increase in carbon dioxide has always followed periods of warming rather than being caused by the warming. In order to substantiate the claim for global warming, accurate historical data must be available. Weather data has been recorded and collected by the National Weather Service. Its U.S. Historical Climatology Network is comprised of 1221 reporting stations within the 48 contiguous United States. These records generally include the period 1900 – 1995. Each station is subject to certain quality-control and homogeneity testing and adjustment procedures. If the data is not reported, it is filled in with data from other nearby sites. Obviously, this can and has introduced major errors in temperature readings. Class I – Sensors are located at least 100 meters (330 feet) from artificial heating or reflecting surfaces, such as buildings, concrete surfaces, and parking lots. Class 2 – Artificial heating sources are located 30 meters (100 feet) away from sensor. Class 4 – Artificial heating sources are less than 10 meters (33 feet) away from sensor. Introduces an error greater than 2°C. Class 5 – Temperature sensor located next to or above an artificial heating source, such as a building, rooftop, parking lot, or concrete surface. Introduces an error greater than 5°C. I went to observe two of the1221 climate-reporting stations. The one in Paso Robles has placed the sensor on a concrete pad, with cars parked against the pad and a building next to it. In addition, it is located next to a major city street with constant heavy automobile traffic. Consequently, the readings from this reporting station have been high, showing an error greater than 5°C or approximately 8°F for several years. It is most disturbing to realize that erroneously high readings from stations like this have been used by climatologists to claim man-caused global warming. Cal Poly also has a climate-reporting station. Its sensor is located five feet from the gravel road and 40 feet from a concrete walkway next to buildings. However there are broken down RVs right next to the sensor. One of them has been sitting there for several years as a heat sink. In addition, there are several chemical test pools between 100 and 200 feet away. Both of these stations fail NWS’ own standards and reporting procedures. In fact, research done by Meteorologist Anthony Watts of “SurfaceStations.org” shows that almost 90% of the 1221 stations report rising temperatures because they are badly sited. It shows that the data has been seriously erroneous. The temperature readings have been consistently too high. The foundation for the claim for man-made global warming which is based on historical data gathered from San Luis Obispo County’s two reporting stations is fallacious. Unfortunately, the reported temperature data, not the earth, is cooked by man. Matt Kokkonen is a San Luis Obispo-based financial planner and political activist. Climate change is not my area of expertise, and it’s highly unlikely that I’ll ever know enough about the science to feel like my opinion is worthy of distribution. However, I do think I have a fair amount of common sense, and it strikes me as entirely unreasonable to think that billions of humans dumping all the stuff into the atmosphere that we dump every day are having no effect on the climate. There are more of us than there have ever been, doing things that have never occurred before in history. I’m thinking that things ARE different than they were 10,000 or 100,000 years ago, and it’s possible that the current situation is not entirely nature-driven as it might have been before. I honestly don’t know whether global warming is real, or human-driven — but I’m also not wlling to just reject the notion out of hand, either. 1. Is it theoretically possible? 2. If it is theoretically possible, then is is really happening? So far, the agents that have been proposed as making human-caused global warming theoretically possible are not convincing, even laughable at times, and the case as to whether it is really happening is even more suspect. And they refuse to even discuss or present actual evidence for verification. Why? Consider the mass of 6 billion humans to that of the total mass of all animals. We are a tiny, tiny fraction. Consider that from space, there is no visible sign of human life on earth. Cool photo, I used to have it hanging on my office wall. 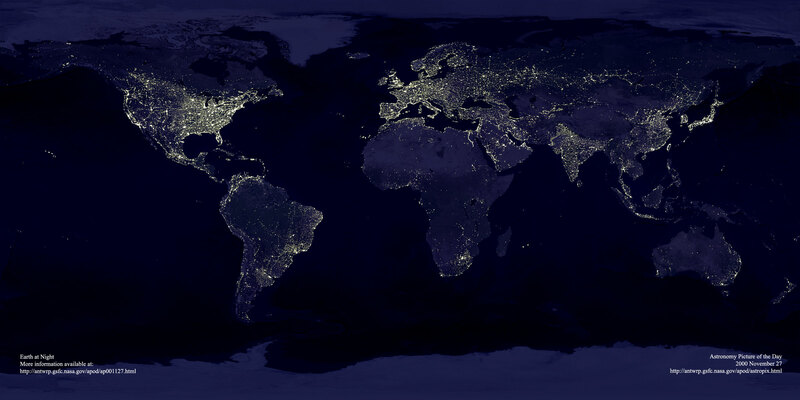 I have always wondered how it was night time all over the world when the photo was taken. Hey! the gulf stream is not supposed to go there! uh oh the Atlantic conveyor is broken. The Arctic seems to be warming up. Reports … all point to a radical change in climatic conditions, and hitherto unheard of high temperatures in that part of the earth’s surface. Ice conditions were exceptional. In fact, so little ice has never before been noted. Dr. Hoel reports that he made a section of the Gulf Stream at 81 degrees north latitude and took soundings to a depth of 3,100 meters. These show the Gulf Stream very warm, and it could be traced as a surface current till beyond the 81st parallel. If Burnt Toast News is going to run a vanishingly flimsy climate change denial screed from a Chartered Financial Consultant and Certified Member of the Fringe, it might at least pick a typeface and stick with it. (You’re using Verdana, not Calibri.) If it actually cares about its editorial credibility, it might give the space to a stronger argument from someone who actually knows what he’s talking about. There are actual scientists who are skeptical of climate change or aspects of it, though there aren’t many who aren’t on the payroll of some hydrocarbon energy interest. And even big oil and other industries are facing up the inevitability of emissions reductions. Kokkonen’s microscopic claims here may be true for all I know, but even if so they would hardly count as a disproof of human-caused climate change and wouldn’t be worthy of O.J. Simpson’s defense team. And when deniers assert that climate change is a deliberate “hoax” designed to take away our freedoms, and not merely erroneous, we enter the realm of Grassy Knolls, Death Panels and Teabaggers. ignorance is bliss, as all studies show co2 follows temperature change, co2 is only 4/ 100th of one percent of the atmosphere, co2 levels were way higher during the dinosaur era and temperature was not. Although 3000 paid climate alarmists signed a petition over 30,000 unpaid climate and other related specialists signed a petition saying they did not believe in human caused warming. NASA has stated the other planets were warming similar to earth , most engineers scientists and other folks with actual scientific backgrounds rarely believe humans are the cause. Folks who believe in human caused warming do so because they believe what they are told, it fits into their existing world view that humans are the problem and they do not have the education or inclination to do the actual factual research. Opinions formed without the facts are nearly impossible to change with facts…..religious beliefs are always immune to the facts and clearly belief in human caused global warming falls into the category of a religious belief. There are ZERO actual facts to support this hoax. calling folk teabaggers is a gross insult, typical of those who have no facts……….. Historical air temperatures inferred from ice core analysis from the Antarctic Vostok station in 1987, relative to the average global temperature in 1900 indicate that from 160,000 years ago until about 18,000 years ago Earth temperatures were on average about 3° C cooler than today. Except for two relatively brief interglacial episodes, one peaking about 125,000 years ago (Eemian Interglacial), and the other beginning about 18,000 years ago (Present Interglacial), the Earth has been under siege of ice for the last 160,000 years (see here: http://gcrio.org/CONSEQUENCES/winter96/article1-fig3.html ). During ice ages the climate is cold, dry, and inhospitable– supporting few forests but plenty of glaciers and deserts. We should be thankful for this 18,000 year round of global warming – it is what has made agriculture and civilization possible. “Climate change” is a theology for power-hungry politicians and the scientists who feed from their trough. Global warming is their religion’s apocalypse. Scientists who question, or even seek to analyze the data are destroyed. The same happened to Galileo when he tried to explain how the solar system worked. The authorities at the time, the Church, silenced him, because it didn’t fit the world view that they used to maintain and expand their authority. I also visited these surface stations a couple of years ago when I first learned of the surfacestations.org website. I saw the same conditions that Matt mentioned in this editorial and even took some photos to submit to the surfacestations.org website. My personal belief is that it is because of a generally poor understanding of science in the general population of the US, and a complacent, lazy and willing to believe media has allowed this global warming bunk to find legs. A casual review of climate history over 10s of thousands of years rather than the past 150-200 years (18,000 years ago most of North America was covered with ice – then those Neanderthals started driving their SUVs and caused global warming :-) ) and a few intelligent questions by the media (e.g. “You said that this is the warmest day in July in 80 years, so that must mean global warming is true – but doesn’t that mean it was warmer 80 years ago?”) would do a lot to fix this situation. You might want to examine the vested interests of hydrocarbon fuel-based industries and the political power they have before you overestimate the venality of any “power hungry” politicians and scientists from Big Environment. It’s the climate change deniers who have clear conflicts of interest, generally not the people concerned about the problem (though admittedly some environmental pressure groups aren’t pure). The Copenhagen summit made it clear how little influence people concerned about climate change have. Like it or not, all science is done by humans and, as such, is influenced by all the same motivations that drive humans – ego, power, etc. The view that science is immune from these influences is naive. Witness the recent “climategate” fiasco that exposed deliberate falsification and cherry picking of data as well as the hijacking of the peer-review process. If you are going to dismiss those who dare to question the global warming belief because of where their funding comes from, then at least be honest about it and dismiss the global warming proponents who derive their funding from the pro-global warming grant gravy train.